It’s never too early for the injury bug to hit a team and unfortunately for the New York Yankees that bug has hit the club even before their first spring training game in 2017. According to Bryan Hoch of Yankees.com the Yankees will be without both Ronald Herrera and James Reeves for a few weeks after sustaining injuries during spring workouts. Herrera, who was traded to the Yankees from the San Diego Padres in the deal for Jose Pirela a couple years back, will miss at least two weeks with shoulder inflammation while James Reeves, an underrated left-handed reliever that could have snuck onto the Yankees Opening Day roster with a strong spring, will miss at least 3-4 weeks with a left elbow sprain. Bummer. 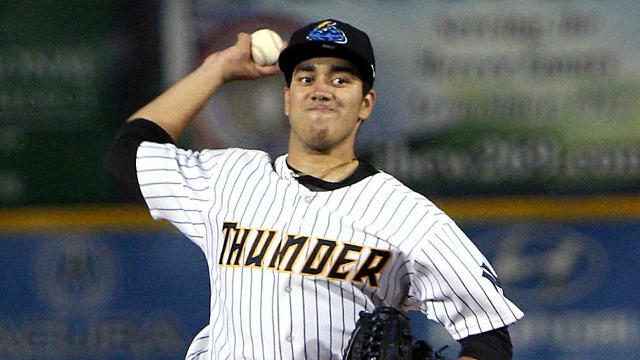 Herrera is just 21-years old and is coming off a 2016 campaign that saw the right-hander put up a 10-7 record with a 3.75 ERA in 132.0 innings in Double-A with the Trenton Thunder. Herrera struck out 123 batters in those 132 innings but he also continued to show he was vulnerable to giving up hits which was evident by his nearly hit per inning ratio last season. Again though, he’s 21. He has plenty of time to put it all together and improve. That’s what the minor leagues are for. Meanwhile Reeves was a 10th round draft pick in the 2015 MLB First Year Players Draft for the Yankees and is coming off a season with the High-A Tampa Yankees where he put up a 5-1 record with a 2.27 ERA mostly out of the bullpen. I say mostly because Reeves did start 12 of his 25 games that he appeared in last season but it still viewed as more of a reliever than a starting pitching prospect at this point in his career. Get well soon boys and get back to the grind. We’re always rooting for you.